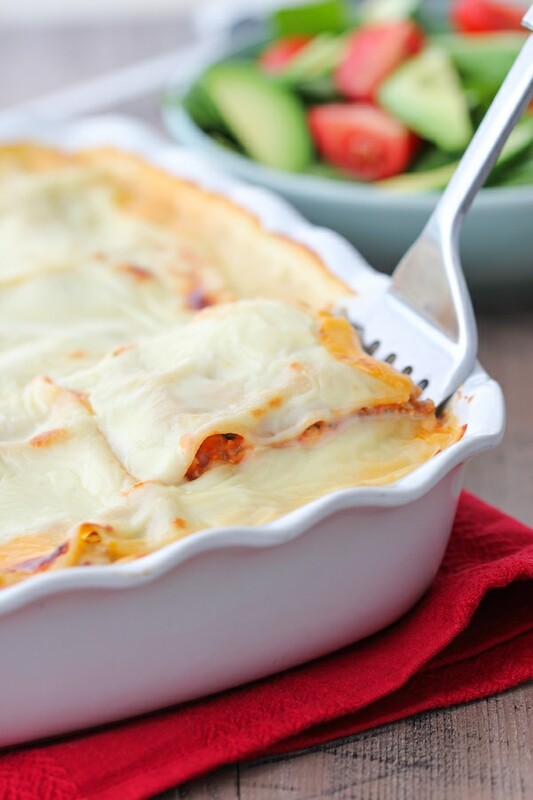 Creamy, rich lasagna is such a comforting family meal. 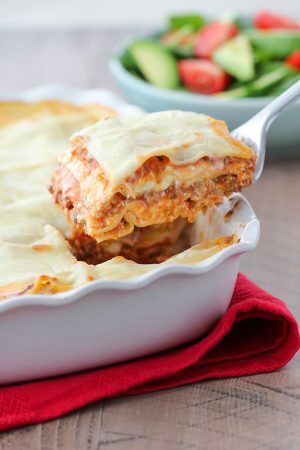 The layers of noodles, hearty tomato meat sauce and luscious cheese filling, it’s no wonder that lasagna is so popular and well loved. If you type in “lasagna” into the Google search box, you will get “About 15,200,000 results” within a few seconds. Now that’s A LOT of lasagna recipes. Since our trip to Italy in 2013, I have been recreating a few very well-known Italian classics, and Lasagna is most certainly one of them. Most cooks have their way of making this homey and comforting dinner. To be honest, I’ve never measured anything for my Lasagna, just stirred in this and that until it looked right, but since I’ve been asked several times for my Lasagna recipe, I figured that this was the perfect time to start measuring. 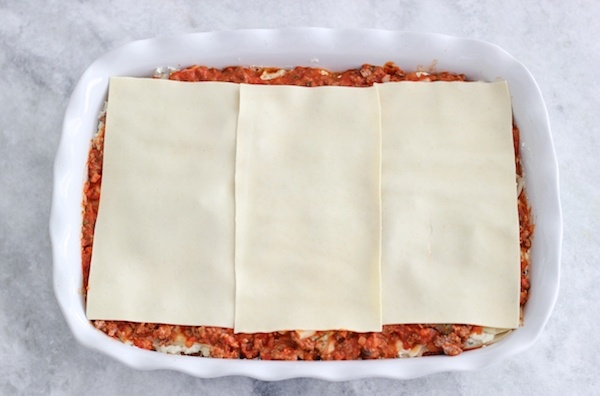 Although I vary how I prepare the lasagna from time to time, overall, this is the the general idea of how I make it, layer by layer. 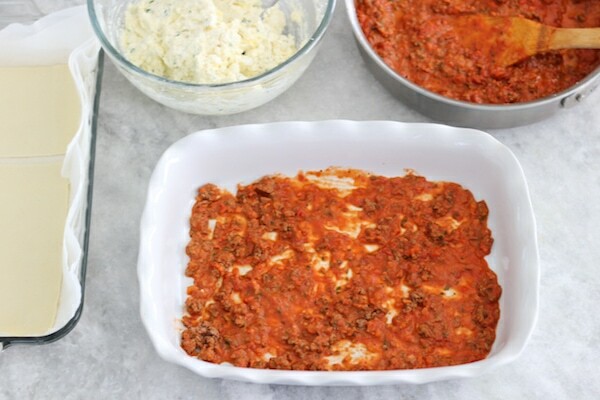 Lasagna is time consuming to make, but once you prep all the components, assembling it is very simple. The best part is that Lasagna freezes really well, so make an extra lasagna while you’re at it. It’s a great gift to give to a friend, maybe you know a family who’s going through a hard time, or someone who just had a baby, or just anyone in general who likes to eat. 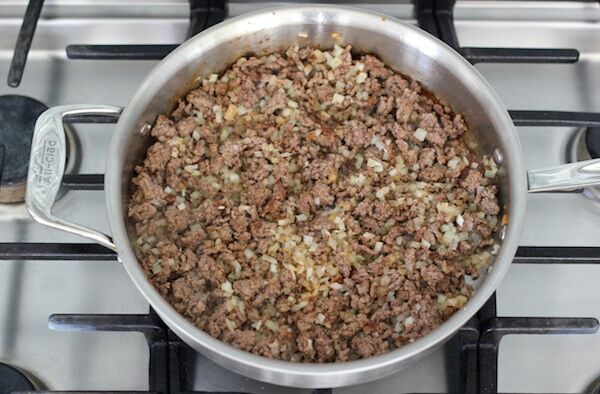 3/4 – 1 lb ground meat, I usually use beef, but you can also use pork, turkey, chicken, etc. I like to use no boil lasagna noodles. You can use regular lasagna noodles, just cook them according to the package instructions. 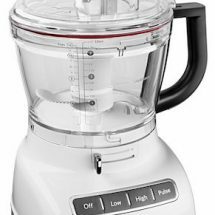 I like the taste and texture of the no boil noodles, but the biggest advantage is that you omit one very annoying step – boiling the noodles, fishing them out, cooling them, etc. Even though the package says that you can just use the noodles straight from the package, I like to soak them in hot water. I’ve tried it both ways and soaking them in hot water softens them up a bit and they cook up better. 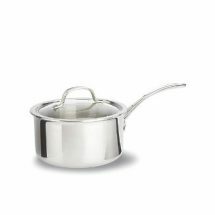 Pour in hot water (not boiling) into the same baking dish you will be using for the lasagna and submerge the noodles in the water. Heat about 1/2 Tablespoon olive oil in a skillet on medium high heat. Add the ground meat. I prefer to use a little bit less meat and more tomatoes, but it’s up to you. My husband likes a good amount of meat in the lasagna:). Season the meat with salt and pepper. Cook until the meat has lost most of its pinkness, and you have nice brown bits throughout. If your meat exudes a lot of grease, drain most of it off, leaving just enough to cook the onions. Add the onion and cook for another 5 minutes or so, until the onion has softened. Break the meat chunks apart, which will help the sauce to have an even consistency. 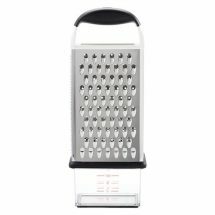 A great trick for doing this is to use a potato masher. Add the crushed tomatoes and garlic, season with salt and pepper and cook at a simmer, covered, for about 5 more minutes. Add the heavy cream and fresh herbs. I add a touch of cream to almost all my tomato sauces. It gives the sauce a nice velvetiness. The fresh herbs are a must. I absolutely love the way they elevate the sauce and give it so much freshness and flavor. Drain the noodles on a paper towel or a clean kitchen towel. 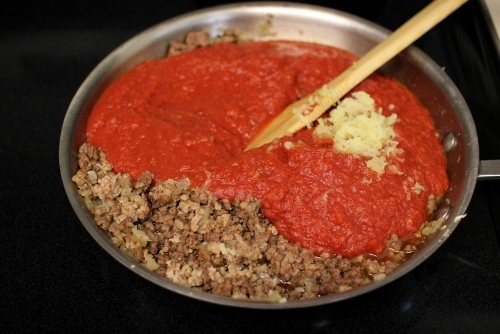 Scoop out about 3/4 cup of the Tomato Meat sauce and spread it out on the bottom of a 13 x 9 inch baking dish. Top with the lasagna noodles. 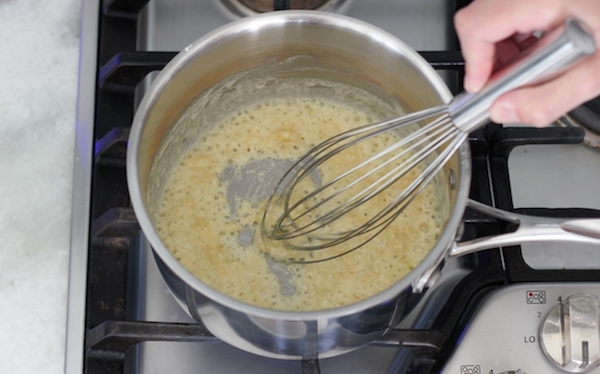 Spread out about 2 heaping Tablespoons of the Cheese Filling on top of each noodle. It’s easier to spread out the cheese filling if you put dollops of it across the surface first. 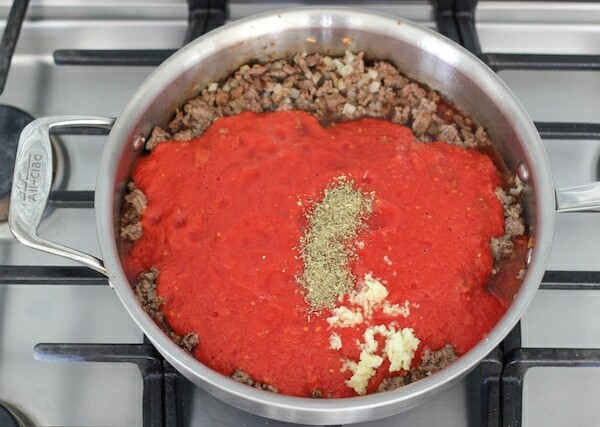 Spread out another 3/4 cup of Tomato Meat Sauce over the Cheese Filling. Repeat with the rest of the layers, ending with a layer of noodles. You will have 5 layers of noodles total. (If you’re using the same pasta as I am, you will use the whole box.) 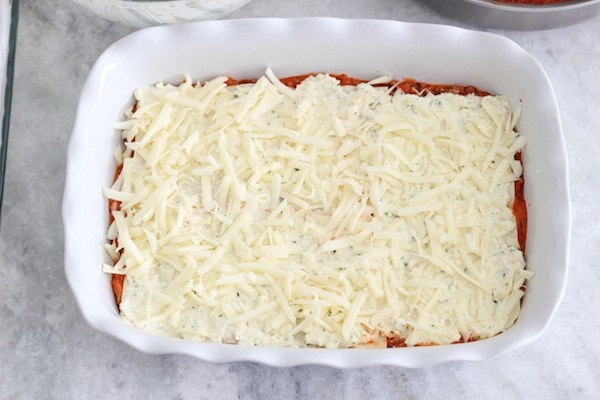 You can add more grated mozzarella cheese in between the layers, if you’d like. 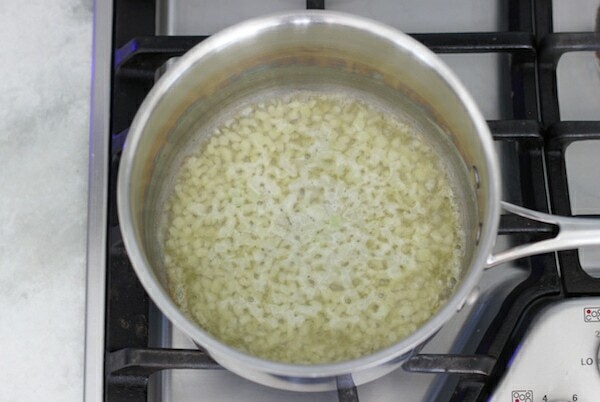 In a small saucepan, melt the butter and add the shallot or onion. Season with salt and cook until tender on medium heat. 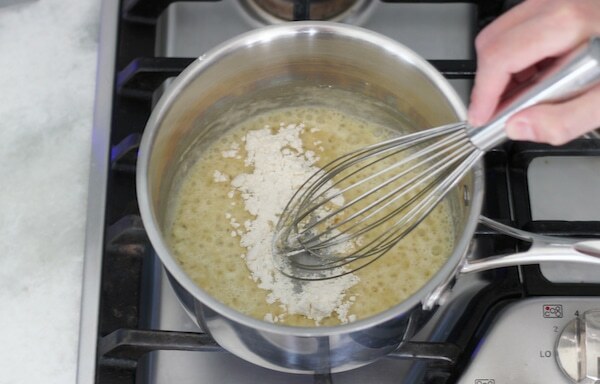 Add the flour and mix until it’s completely incorporated into the butter, and cook for about a minute. 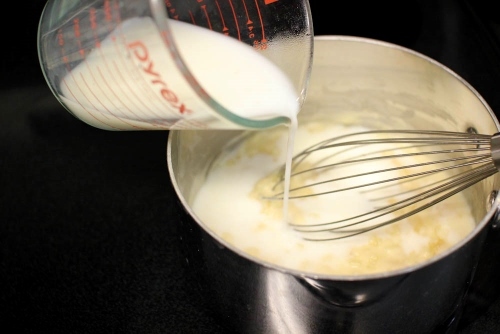 Whisk in the milk and chicken broth. 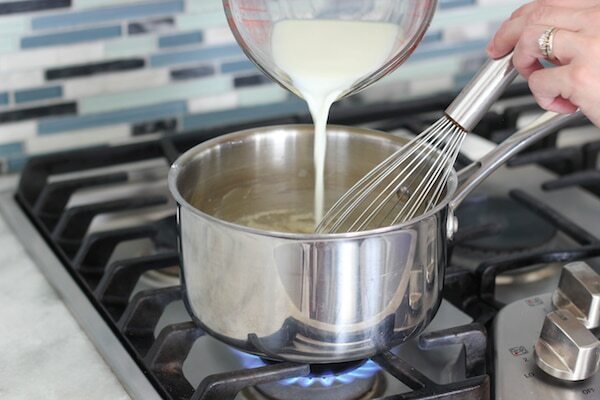 You can use just milk in the sauce, but adding part chicken broth will give it more depth of flavor. Add the dry bay leaf and season with salt and pepper. Cook at a simmer for about 5 minutes, until the sauce thickens. Fish out the bay leaf. 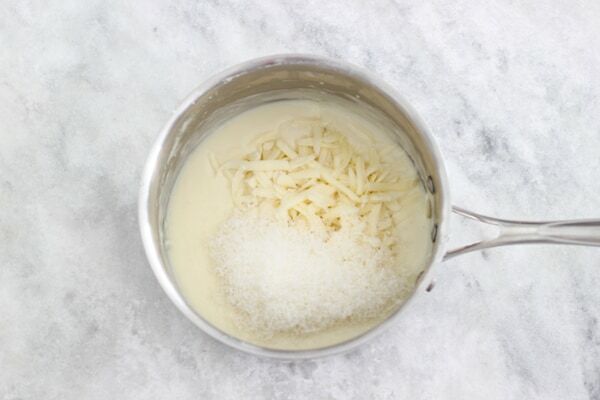 Take off the heat and stir in the grated cheeses. 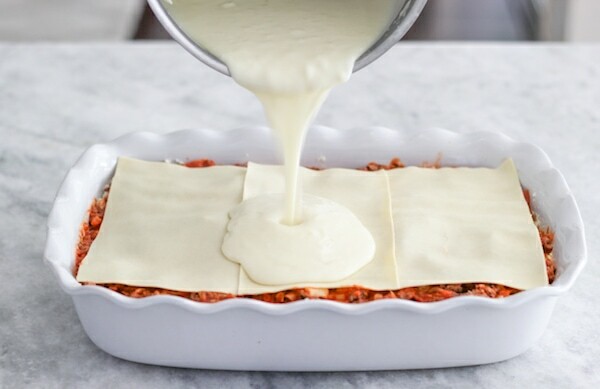 Pour the cheese sauce over the last Lasagna layer and smooth it out. Bake in a preheated 400 degrees Fahrenheit oven for about 40 minutes, until it bubbles around the edges. Take off the aluminum foil and broil for a few minutes until the cheese is golden, if you’d like. Cool the Lasagna to room temperature. Wrap it in several layers of aluminum foil and plastic wrap and freeze. 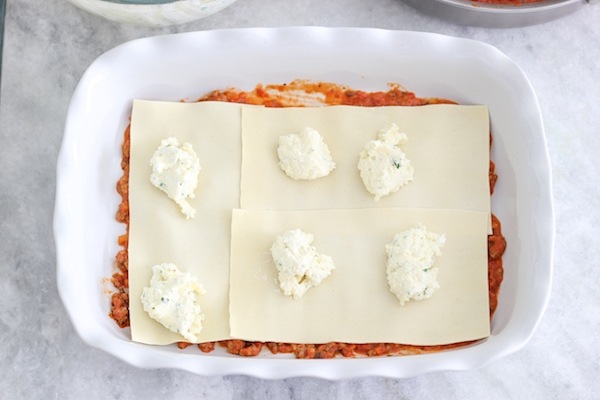 To cook: Thaw the lasagna overnight and bake, just as you would if you made it that same day. Pretty neat, huh? 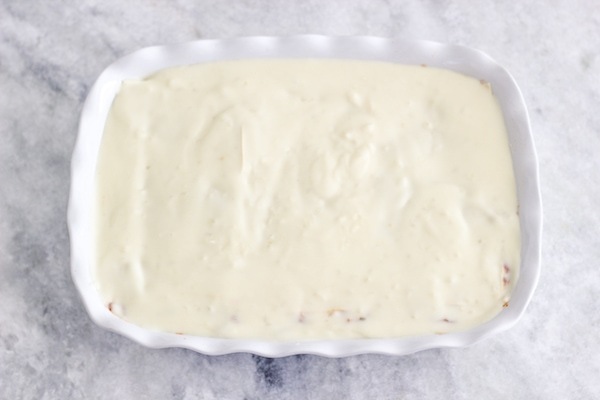 You can even put it in the oven frozen, but only if you are not using a glass baking dish, since it might crack from the extreme temperature change. It will take longer to cook through, but it will totally work. 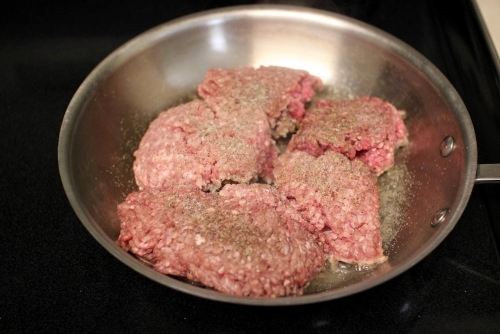 ¾ - 1 lb ground meat, I usually use beef, but you can also use pork, turkey, chicken, etc. I like to use no boil lasagna noodles. You can use regular lasagna noodles, just cook them according to the package instructions. I like the taste and texture of the no boil noodles, but the biggest advantage is that you omit one very annoying step - boiling the noodles, fishing them out, cooling them, etc. Even though the package says that you can just use the noodles straight from the package, I like to soak them in hot water. I've tried it both ways and soaking them in hot water softens them up a bit and they cook up better. 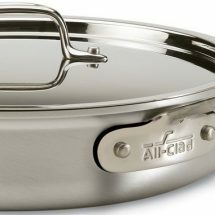 Pour in hot water (not boiling) into the same baking dish you will be using for the lasagna and submerge the lasagna noodles in the water. Heat about ½ a Tablespoon olive oil in a skillet on medium high heat. 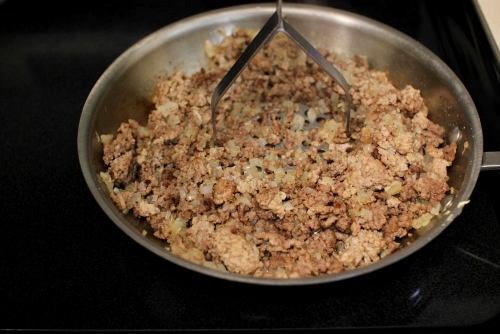 Add the ground meat. Season the meat with salt and pepper. Cook until the meat has lost most of its pinkness, and you have nice brown bits throughout. If your meat exudes a lot of grease, drain most of it off, leaving just enough to cook the onions. Add the onion and cook for another 5 minutes or so, until the onion has softened. 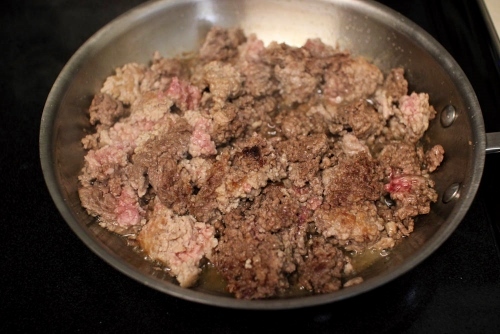 Break the meat chunks apart, which will help the sauce to have an even consistency. 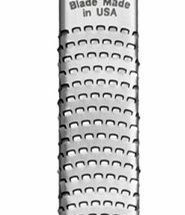 A great trick for doing this is to use a potato masher. Add the crushed tomatoes and garlic, season with salt, ground black pepper and Italian seasoning and cook, covered, at a simmer for about 5 more minutes. 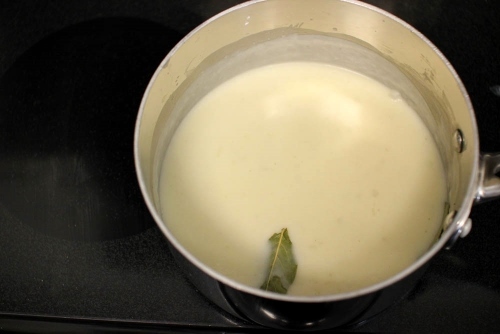 Add the heavy cream and fresh herbs. I add a touch of cream to almost all my tomato sauces. It gives it a nice velvetiness. The fresh herbs are a must. I absolutely love the way they elevate the sauce it give it so much freshness and flavor. 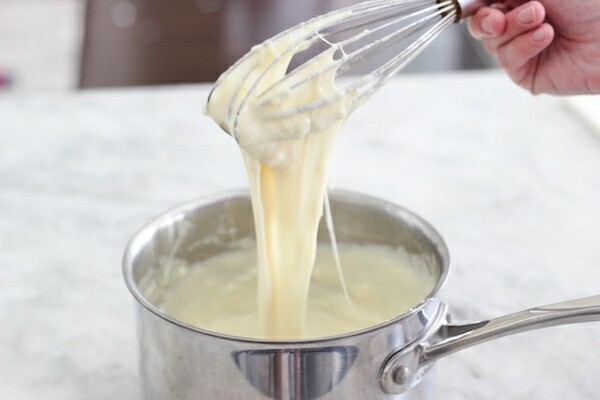 While the sauce is cooking, stir together all the ingredients for the cheese filling. Drain the noodles on a paper towel or clean kitchen towel. 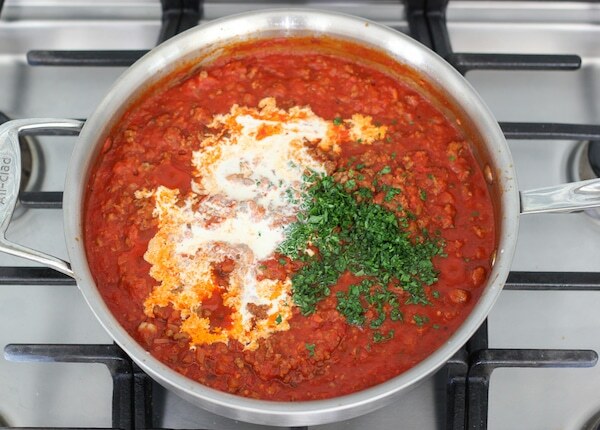 Scoop out about ¾ cup of the Tomato Meat sauce and spread it out on the bottom of a 13x 9 inch baking dish. Top with the lasagna noodles. 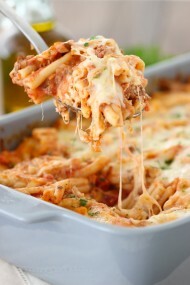 Spread out about 2 heaping Tablespoons of the cheese filling on top of each noodle. 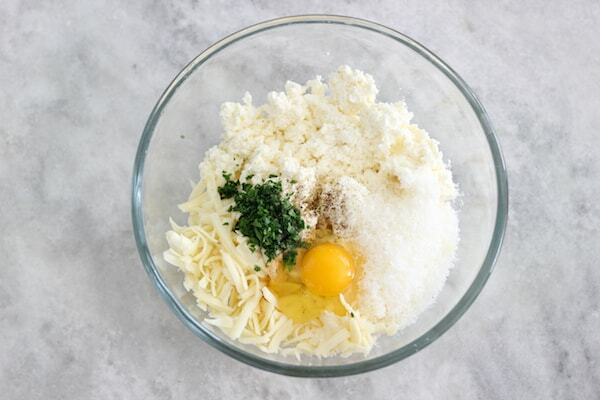 Add the flour and mix until it's completely incorporated into the butter, and cook for about a minute. Add the bay leaf and season with salt and pepper. Cook at a simmer for about 5 minutes, until the sauce thickens. Fish out the bay leaf. 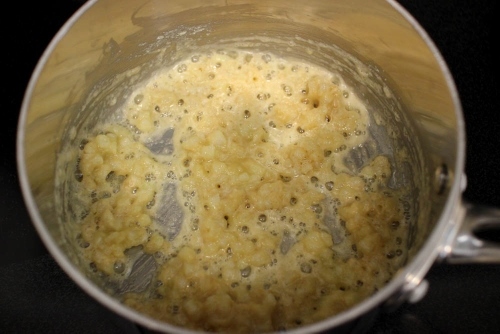 Take the cheese sauce off the heat and stir in the grated cheeses. Take off the aluminum foil and broil for a few minutes until the cheese is golden, if you'd like. Cool the Lasagna to room temperature. Wrap it in several layers or aluminum foil and plastic wrap and freeze. 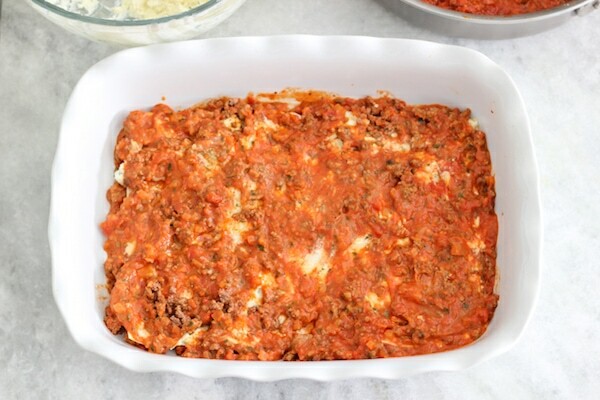 - To cook: Thaw the lasagna overnight and bake, just as you would if you made it that same day. Pretty neat, huh? What a perfect meal. 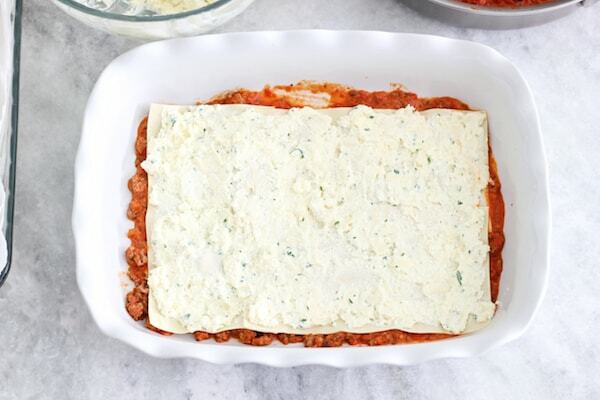 Lasagna ingredients are so versatile and you can change them with what you have on hand. Thanks for stopping by EEs. I really like the cheese sauce. It makes the Lasagna extra special, Oksana. Wow! I have never heard of that cheese sauce. Definetely will give it a try! 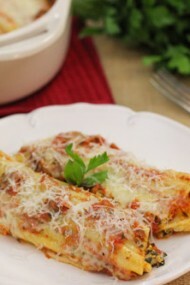 My family loved this lasagna, kids was eating and eating. Thanks a lot Olga, great job. Natalka, thanks so much for letting me know! I’m glad your family enjoyed the Lasagna. Looks great! I was just wondering if I can omit the egg or substitute it with something else? My son is allergic to eggs and I don’t use them when I cook. Thank you. Yes, Marina. You can just omit the egg. Yay! SO glad you enjoyed it, Tanush. I made lasagna for the first time today and it came out out perfect. Thanks for the delicious recipe!!! Yay! That’s awesome to hear, Vika! Thanks for taking the time to let me know. Olga, I had tried few of your recipes and absolutely loved them all! You are amazing. Thank you so much for sharing these. Made this lasagna today, and my hubby loved it. Thank you ! Thanks for taking the time to write, Tatiana. I’m so happy to hear that you and you husband enjoyed the Lasagna. I highly recommend to try it!!! This was absolutely delicious, I doubled the recipe to feed my husband and several of his friends and doubled the meat filling. Honestly it tasted much better then any lasagna I had ever tried! It was a big hit. Many of the guys couldnt believe this was homemade Lasagna, one of the guys even suggested, “You should open up your own italian restaurant, this is so delicious” Lol! Thanks for another wonderful recipe Olga! I’m so excited to hear that, Veronica. I’m always so happy to read feedback. Wow- I had no idea these no boil noodles existed! I will have to stock my pantry with them and be done with the regular ones. 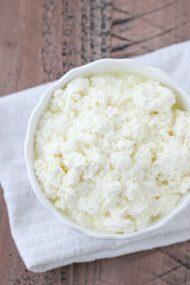 I absolutely love the cheesiness of this recipe, no pun intended. I usually just bought the ricotta and that was the cheese filling. Thank you for sharing! Yes, the no boil noodles are so convenient, Tanya. There are great to have in your pantry for sure. I am planning on making this tomorrow but I have a few questions. First, I’d like to put in jarred tomato sauce, instead of making it. Do you recommend any for this? And second, I plan on making this earlier on in the day and just put it in the oven before dinner. 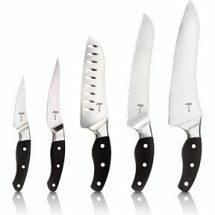 What steps would you recommend? Should I leave out the cheese sauce until the end? Or will this not work well. 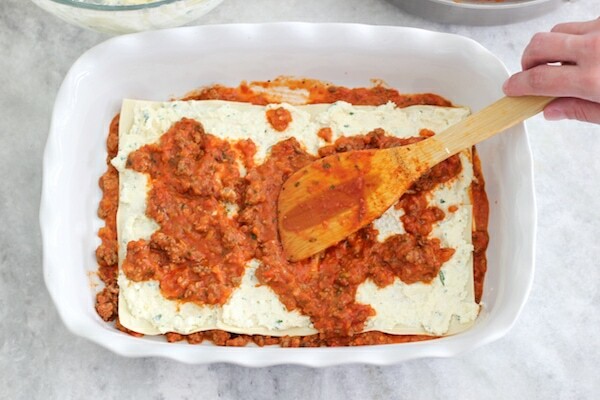 Yes, Anna, you can use jarred tomato sauce and you can also prep the entire lasagna ahead of time, even a day ahead, cover it and refrigerate until you are ready to bake it. Bring the dish to room temperature for about 20 minutes after taking it out of the refrigerator before putting it in the oven. Lasagna freezes really well too, so you can do that as well. 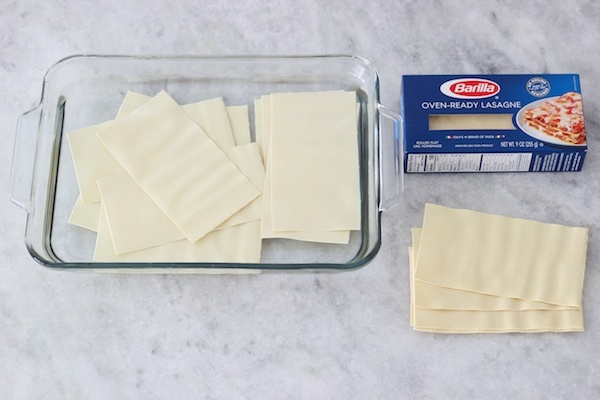 Prep the lasagna, seal it tightly and freeze. Then simply defrost and bake. I just wanted to let you know that I did make the lasagna for a dinner party and everyone agreed- it was delicious! Thank you! Btw, congratulations on your pregnancy! May the Lord keep you and the little one safe and healthy in His hand! That’s awesome, Anna! Thanks for taking the time to write. 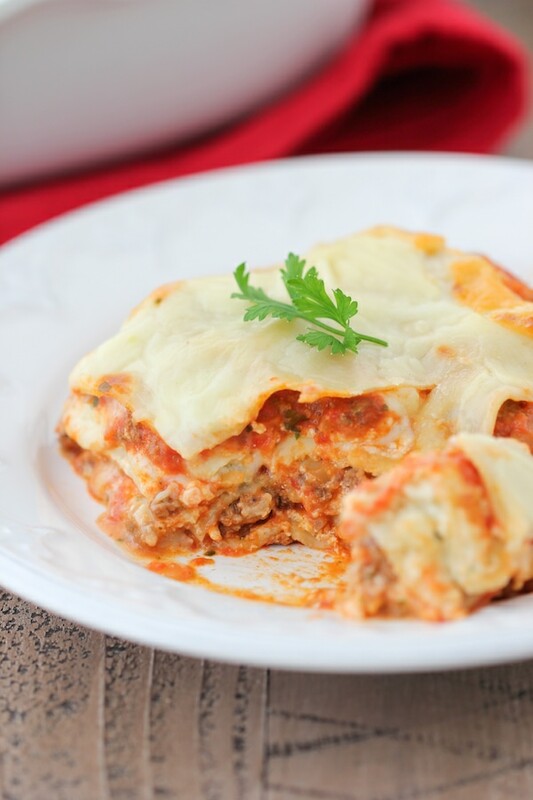 Delicious lasagna recipe! Also my first time trying with the cheese sauce, we really like it 🙂 thanks for all the wonderful recipes that never dissapoint! When I saw your Lasagna pic, I knew I had to make it. Beautiful! Thank you, Julia:). I hope you enjoy it. Love your lasagna, when I make it, I just double the recipe because everyone in my family loves it. Thank you for the recipe. I tried making this today and all my noodles got stuck together, it was a disaster. Any ideas why it would do that? You must have kept them in the water too long or there wasn’t enough water to coat the noodles. I only keep them in the water just enough time to assemble the lasagna and work very fast when doing it. make sure you have the cheese layers and the sauce ready before you start working with the noodles. Also, if you still have that problem, just use the noodles raw. They are meant to be used that way, so it will definitely work out. I’m sorry you had trouble with it, Natallia. Delicious!!!! This is the only recipe I’m using when making lasagna. Very yummy. My husband and I are not big on tomato sauce but this is just perfectly balanced dish!!!! We love it!!! That’s wonderful, Inna. Thank you so much for taking the time to write. I’m really glad to hear that you enjoyed the lasagna. Made this today and it turned out amazing!